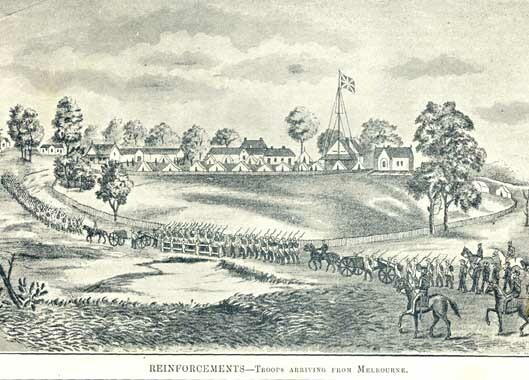 Difference between revisions of "Military"
Two regiments of the British Army were involved in the [[Eureka Stockade]]. They were the 12th Regiment and the 40th Regiment. April 1854 - June 1854 (Belfast and Cork); July 1854 to September 1854 (Cork and at Sea); October 1854 to November 1854 (At Sea); October 1854 to March 1855 (Victoria). The first references to NSW are on reel 3715: August 1854 to September 1854 and 1856 (a detachment in Victoria and NSW); October 1854 to October 1854 (detachment NSW). The lat references to NSW are on reel 3730: April 1866 to September 1866 (detachment NSW); October 1866 to November 1866 (NSW and New Zealand detachments). Reel 2994 covers April 1867 to June 1867 (New Zealand and At Sea); July 1867 to August 1867 (Devonport and Gosport). April 1854 - June 1854 (Belfast and Cork); July 1854 to September 1854 (Cork and at Sea); October 1854 to November 1854 (At Sea); October 1854 to March 1855 (Victoria). The first references to NSW are on reel 3715: August 1854 to September 1854 and 1856 (a detachment in Victoria and NSW); October 1854 to October 1854 (detachment NSW). The last references to NSW are on reel 3730: April 1866 to September 1866 (detachment NSW); October 1866 to November 1866 (NSW and New Zealand detachments). Reel 2994 covers April 1867 to June 1867 (New Zealand and At Sea); July 1867 to August 1867 (Devonport and Gosport). 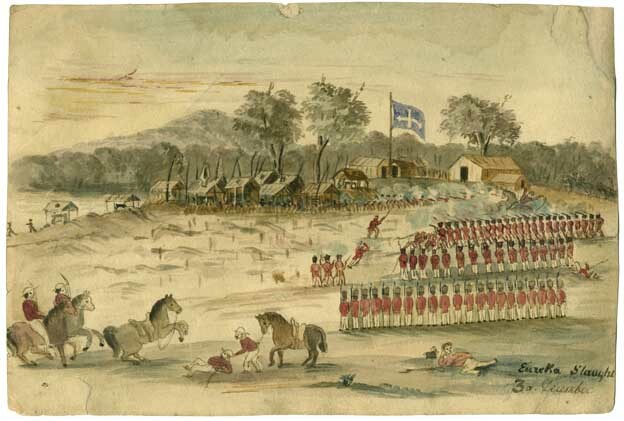 The 40th Regiment were involved at the Eureka Stockade on 3 December 1854. 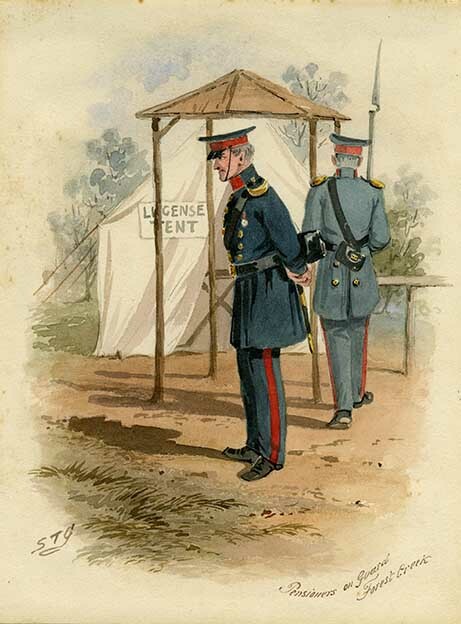 After Eureka some of the 40th Regiment were posted to [[New Zealand]]. I am directed by His Excellency the Lieutenant Governor to ? you that from information which he has received he is aware of a recent ??? existing at Ballaarat the strength and objects of which it is important to ascertain – you are therefore authorized to expend the sum of £100 (one Hundred Pounds) in the investigation of the matter. I am also to inform you thus you letter of the 25th November to the Chief Commissioner of Gold Fields has been laid before His Excellency and that he does not ?? it ? ??? at present any further enforcement at Ballaarat being of opinion that when you ? the Police in your vicinity, which you are to do, that you will have sufficient force to hold your own position. His Excellency further desires that you lay in, if possible, a fortnights provision for ? You will also take ??? constantly informed as to the transactions ? Ballarat, and you many rely on having? Company of Military in 36 hours after ? letter is dispatched. I need scarcely point out the ? of unnecessarily moving the ? you will therefore consider well before you ? A request of His Excellency. The Lientenant Governor desires ? to express his appreciation of this resolution to ? your position which you ?, and he ? with confidence on the judgement and ? of his Officers, who may equally rely upon ? for efficient ? I have received instructions from the Lieutenant Governor, to express to you the great satisfaction Her Excellency feels with the conduct of the Civil Officers and the Forces under their command during the recent transactions at Ballarat . 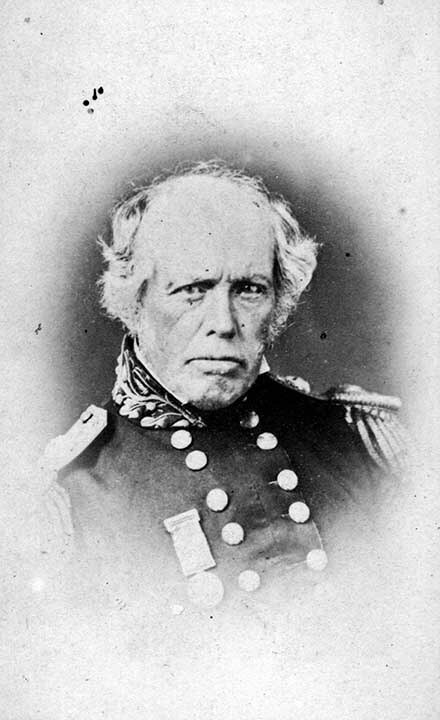 The conduct of the Military will of course be commended upon by the Resident Commissioner Ballarat. The 40th (2nd Somersetshire Regiment) arrived in Victoria from England in October 1852 at the request of Governor [[Charles LaTrobe]]. [[Adams]], [[Arthur Atkinson]], [[Thomas Bass]], [[Josiah Bigsby]], [[Thomas Bodely]], [[George Bowdler]], [[Thomas Breadley]], [[Denis Brien]], [[Patrick Butler]], [[John Broadhurst]], [[Thomas Bruce-Gardyne]], [[Patrick Burke]], [[George Byford]], [[John Byrne]], [[John Cameron]], [[John Campbell]], [[Edwin Coles]], [[William Cork]], [[Henry Cottes]], [[Martin Cusack]], [[Patrick Dwyer]], [[Thomas Fitzgerald]], [[William French]], [[Thomas Frost]], [[William Gardener]], [[Michael Gay]], [[James Gore]], [[Daniel Hagerty]], [[Israel Hales]], [[Charles Hall]], [[Edward Harris]], [[Daniel Hegarty]], [[James Hill]], [[Alfred Hurlestone]], [[Hutchings]], [[Joseph Jubb]], [[William Juniper]], [[John Keeble]], [[James Kelly]], [[Laurence Kelly]], [[Hugh King]], [[Charles Ladbrook]], [[Francis Langham]], [[John Langham]], [[James Louge]], [[Patrick Lynot]]<ref>Email from J. Fawcett to C. Gervasoni, 28 November 2004.</ref>, [[William MacCarron]], [[Private John Manning]], [[Michael McAdam]], [[Peter McCabe]], [[John McEvoy]], [[Thomas McDermott]], [[John McGurk]], [[Samuel McKee]], [[John Macoboy]], [[William Manella]], [[Michael McAdam]]<ref>Email from J. Fawcett to C. Gervasoni, 28 November 2004.</ref>, [[Charles Meacham]], [[William Mole]], [[Arthur Mollers]], [[Michael Moran]], [[Lot Mullen]], [[Michael Murphy]], [[William Murrell]], [[Charles Must]], [[John Neill]], [[Thomas Nelson]], [[Mark Noble]], [[Michael O'Connel]], [[Edward O'Dell]], [[Bernard O'Donnell]], [[Patrick O'Keefe]], [[Henry Patchett]], [[William Prayle]], [[Joseph Rayner]], [[Thomas Reed]], [[Patrick Reilly]], [[William Revel]], [[Bailey Richards]], [[William Richardson]], [[Edward Riley]], [[Michael Roney]], [[John Ryan]], [[John Sharland]], [[Patrick Sinnott]], [[William Smith]], [[Cornelius Sorrell]], [[James Stowe]], [[Patrick Sullivan]], [[William Swan]], [[John Thomas]], [[James Turner]], [[Thomas Valiant]], [[Joseph Wall]], [[Patrick Walsh]], [[William Webb]], [[Henry Wise]], [[Hans White]], [[John White]]. G H Mann said in his memoirs that he was a soldier stationed at Ballarat. 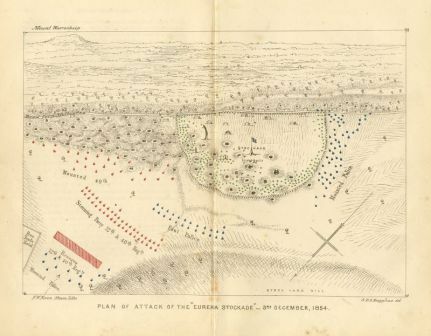 He described the storming of the Eureka Stockade as similar to the storming of the barricades in Paris. '40th Regiment storm the barricades'.<ref>Clare Wright, The Next Throb of Outraged Humanity: Australia in a Revolutionary Age, In David Headon and JohnUhr (editors), Eureka Australia’s Greatest Story, The Federation Press, p. 45; SLV MS 9288</ref> [[G H Mann]] was not on the listing in Sabretache nor in the Pay and Muster Lists. However, they are notoriously difficult to research, and his name may have been omitted. His memoirs can be found at the State Library of Victoria, MS 9288. 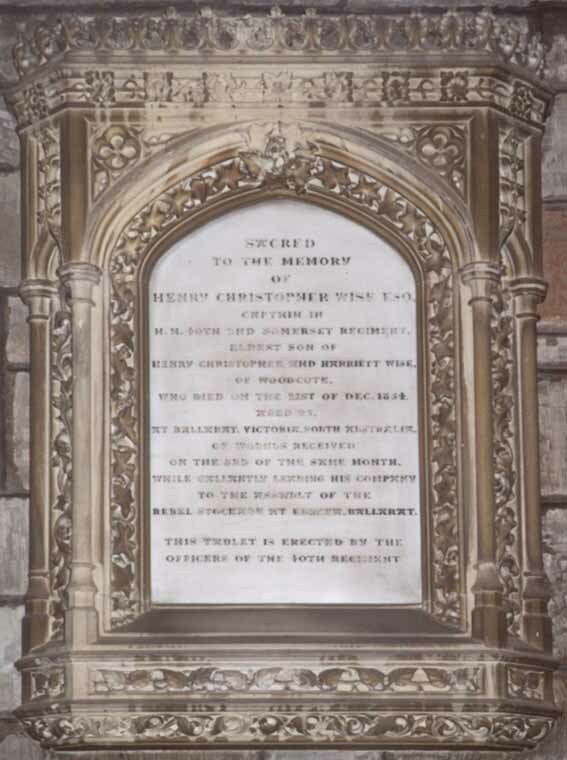 [[File:Wise memorial Leek Wooton by CG-wiki.jpg|700px|thumb|right|''Wise Memorial, Leek Wooton,'' Photography: Clare Gervasoni, 2001.<br /><br />"Sacred to the memory of Henry Christopher Wise Esq, captain in H.M. 40th 2nd Somerset Regiment. Eldest son of Henry Christopher and Harriett Wise of Woodcote, who died on the 21st of December 1854 at Mt Ballarat, Victoria, South Australia, or wounds received on the third of the same month, while gallantly leading his company to the assembly of the rebel stockade at Eureka, Ballarat. This tablet is erected by the officers of the 40th Regiment."]] About an hour afterwards a detachment of the 12th Regiment, with arms, ammunition,and baggage came into Ballarat by Eureka. :EUREKA STOCKADE VETERAN DIES. SOLDIERS' SYMPATHY WITH MINERS. 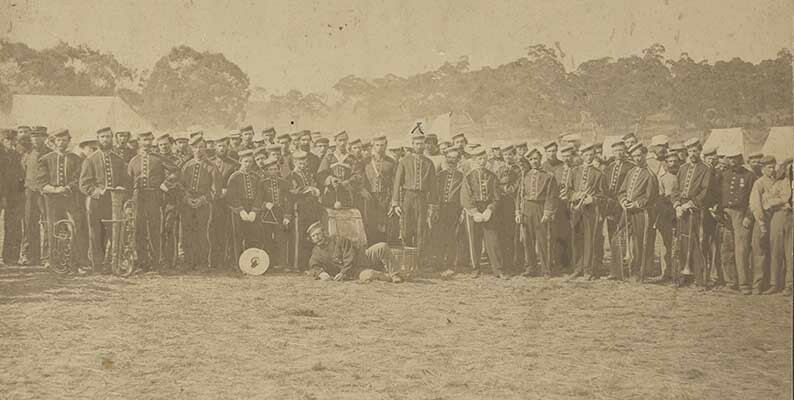 The Pay and Muster Rolls for the 12th Regiment can be found on microfilm rolls at the Mitchell Library, NSW. These are part of the Australian Joint Copying Project (AJCP). 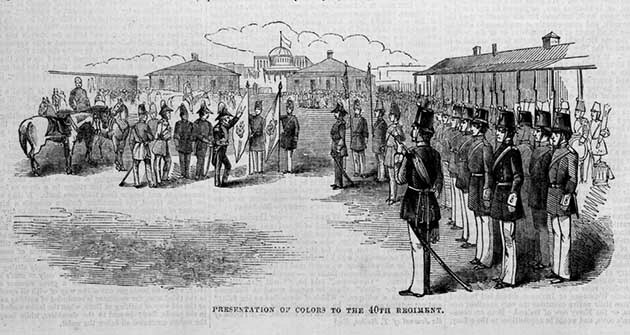 From the Muster for October, November and December 1854 it would appear that the Regiment was considerably divided. While no officer or man is actually shown as stationed at Ballarat in December some are shown there on the Muster Rolls for November 1854, so that one can assume they took part in the Eureka Affair.